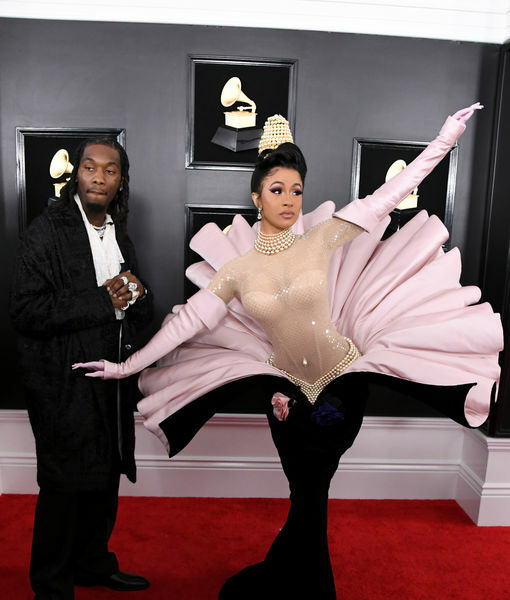 Cardi B & Offset Boo’ed Up At 2019 Grammy Award Show! Cardi B wants us to all know she and her Migos estranged husband are working things up. The Dominican oyster rapper told Extra that she and are hubby are “We’re working things out……work in progress”. Offset cheated on Cardi B multiple times, and went to great lengths to get her back. Cardi won Best Rap Album for her Invasion Of Privacy album that dropped last year. Do you think she deserved the tittle or are they gassing her. I think she deserved the nod, but I think AstroWorld was way better. Take a look at these outfits tho! Offset look lichee just jumped out the bed, and hopped into Cardi B picture. And Cardi look like a raw oyster brought with some stolen food stamps! It’s 90 vintage couture, and its from the Thierry Mugler’s Fall 1995 Couture Collection. The “kiss” tho was a bit much as well, and its a lil cringy! Im not going to lie. Previous ICE Cant Take Any Of 21 Savage’s Millions During His Deportation Case! Next The 2019 Grammy Awards (Hosted By Alicia Keys )Hip Hop & R&B Winners Of The Night! Cardi B, H.E.R., & More!